Have you tasted raw organic honey before? Drizzled over the peanut butter, biting into this sandwich was an explosion of flavor. I remember so specifically the bright, sweet eruption of sweetness as it touched the roof of my mouth. I swooned, truly I did! It was honey <3 at first bite! Easy enough right? 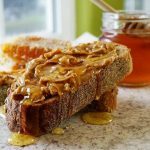 Slather the bread with peanut butter and top with honey. Don't eat peanut butter? Substitute any nut butter. Simple, perfect and fabulous!